It's hard for me to believe it was 40 years ago that my family gathered around our black-and- white TV set at Nantasket Beach (where we spent the summers) and watched real footage of astronauts walking on the moon. I remember it very clearly. I was 8 years old. I remember poring over maps of the moon's surface, knowing what a LEM was, thinking that astronauts were heroes. And they were. The space program, frankly, hasn't been as exciting since then. 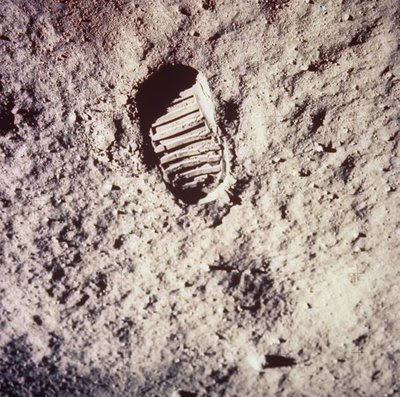 There have been other lunar missions, the development of the Space Shuttle, and several famous and tragic crashes, but nothing as exciting as watching Neil Armstrong and Buzz Aldrin walk on the moon. P.S. Here are some great photos courtesy of the Boston Globe. I don't remember seeing him step on the moon, but I do remember my father picking up make-it-yourself lunar modules when he filled up at the ARCO (remember that brand?) gas station. They were made out of semi-sturdy paper that you cut out and folded together. (Then after that promotion, they offered Noah's Ark animals! I think you might have had to purchase the ark, or maybe fill up your car like 10 times! But each time you filled up you got a set of animals. I can just picture all of us in the "way back" of our station wagon arguing over who got to have the latest pairing. I believe I completed my whole set! Gas stations must have been the precursor to McD's and BK giveaways. I remember the paper lunar modules, and I also remember (a couple of years later) getting rubber band powered lunar rover attached to a bottle of Tang - I used to love Tang, and Space Food Sticks. My memory of that day in July is tinged with regret, because I didn't actually see it. At 7 yrs old I was so very tired and cranky by the time Neil Armstrong was on on the ladder that I told my father (who was desperately trying to keep me awake) that I had to go to sleep NOW! And I did - missing one of the biggest events in human history. I think that's my only true regret in this life, but that's the way things go.